The saying "You are what you eat" isn't exactly accurate. Actually, you are what you absorb from what you eat. The health of your digestive system determines how well nutrients get absorbed from your food and how effectively toxins are filtered out and eliminated from your body. A healthy digestive system has a positive effect on everything from your energy, moods and skin to your ability to fight off colds and flu this winter, and more serious illnesses later on. 1. Eat local fruits and vegetables in season, when possible. Local foods are fresh and alive with enzymes, have the highest levels of nutrients and contain fewer pesticides than produce imported from foreign countries. Ask the produce manager at your supermarket to purchase locally grown products. Shop at local farm stands and farmer's markets. 2. Plan ahead. Carry food with you. These are two of the greatest tools for healthy eating. If you make your own healthy lunch, you will avoid eating unhealthy fast food or snacks during the day. Just put some leftovers or a sandwich with a salad and/or a piece of fruit in a bag. Be sure to have plenty of zip-lock bags and small containers on hand to simplify the process. Planning meals this way saves both money and time. 3. Eat small, frequent meals to sustain energy levels. When your brain gets foggy or you feel sleepy during the day, have a healthy snack for an immediate boost. Quick snack ideas: half a sandwich saved from lunch plus a piece of fruit; rye crackers and cream cheese with tomatoes; a rice cake with peanut butter and apples; a cup of soup and granary roll; or a handful of nuts and raisins. 4. Eat when hungry; stop when satisfied. This sounds like a simple statement, but often we eat when we aren't hungry because we're lonely, angry, depressed, bored or because we're at a social event and everyone else is eating. Eating when you're not hungry contributes to poor digestion. Let your body use what it has before you put more into it. Before you eat anything, ask: Am I hungry? If not, divert your attention to other activities. 5. Relax while eating. Sit down when you eat to rejuvenate your body and spirit. Eat slowly and relish your food. Take a few moments to reflect on your day and your life. Before you eat, take a moment to be grateful for the bounty of the earth we live on, for the people in your life, for the people who produced the food. Being in a calm state helps with digestion. 6. Choose organically grown produce, dairy, poultry and meats whenever possible. Organic farmers pay more attention to their animals' health, and we benefit because we don't get unwanted hormones and antibiotics in our meat, poultry and dairy. Recent studies show that mineral levels in organically-grown produce were twice as high on average as commercially grown foods. 7. Eat as many fruits and vegetables as possible. Fruits and vegetables are chock-full of vitamins, minerals, fibre and phytochemicals (plant chemicals) that protect us from heart disease, cancer and many digestive diseases. 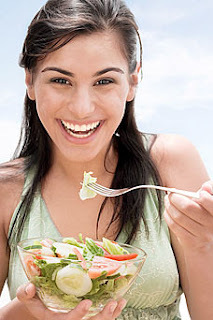 Try to eat at least five servings a day, but more is better - up to nine or 11 is ideal. 8. Increase high-fibre foods. Fibre is critical to digestive wellness. In addition to fruits and vegetables, the richest sources of fibre are wholegrains (brown rice, whole wheat, bulgur, millet, buckwheat, rye, barley, spelt, oats) and legumes (lentils, split peas and all beans except green beans). A high fibre diet of 20-30 grams of fibre a day may help to prevent obesity, diabetes, irritable bowel syndrome, constipation, diverticular disease, colon cancer, heart disease, appendicitis, hemorrhoids, varicose veins, Crohn's disease, hiatus hernia and peptic ulcers, among others. 9. Choose lean protein and eat high oily fish two or three times a week. On average, we eat too much protein, and this excess can tax the kidneys. The saturated fats found in beef, pork and the skin of poultry are artery-clogging and ought to be avoided. Focus instead on lean protein sources such legumes, skinless poultry and fish including salmon, mackerel, tuna, anchovies, sardines, herring, trout or eel. 10. Drink clean water. Getting plenty of high-quality water every day is one of the most promising routes to digestive wellness, and can help prevent many health conditions, from gout to asthma to ulcers. If you drink tap water, a simple water filter can efficiently remove chlorine. Activated charcoal filters are inexpensive and can remove many pollutants from tap water. Distilled water is not a good option, as the regular consumption of distilled water leads to leaching of minerals from the body. 11. Respect your own biological uniqueness. The foods that are best for you are foods that agree with your body and your unique biochemistry. Some people do best on a high-complex carbohydrate, high-fibre, natural-foods diet. Others seem to do best on a low-carbohydrate, relatively high-protein diet high in fruits and vegetables. Many people with digestive problems do best avoiding all grains and dairy. Note: Experiment with your own diet to find out what works best for you specifically. A proper diet ought to make you feel energetic and keep your immune system strong. It should also be balanced and easy to stick with over the long term.